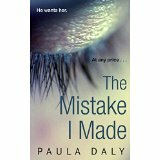 Enormous thanks to Ben Willis at Penguin Random House for a copy of Paula Daly’s ‘The Mistake I made’ in return for an honest review. It was published in Hardback by Bantam Press on 3rd September 2015. Physiotherapist Roz Toovey is a struggling single mum whose errant husband is totally unreliable so that bringing up George falls almost entirely to her. When her financial difficulties become insurmountable, she is made an offer she can’t refuse. It would have been better had she done so. ‘The Mistake I Made’ is a cleverly crafted novel that doesn’t have neat answers to all the issues raised and that makes the reader question how they might themselves behave in Roz’s situation. As a result, it is a gripping and compelling thriller. I think the underlying accurate factual detail about Roz’s work helps add an authenticity to the text, so that it is easy to accept her thought processes and choices – even when they are obviously going to take her into even more trouble. Similarly, the Lake District setting is perfectly described and acts as a beautiful counterpoint to the messy life Roz finds herself leading. This highly skilful writing means ‘The Mistake I Made’ is one of those books that makes you question what normally you see and accept without thinking. I thoroughly enjoyed the first person approach so that it feels as if Roz is speaking to the reader directly. She has a matter of fact, and sometimes surprisingly humorous, tone that understates the difficulties that will arise and it is easy to see how one casual event can so easily lead to another. As I read I kept thinking of the quotation ‘Oh, what a tangled web we weave. When first we practise to deceive!’ Events for Roz certainly build up at an incredible pace. I found Roz foolish, brave, flawed and someone with whom I’d like to be friends. Indeed, all the characters are well drawn. There’s a small range of people but somehow Paula Daly has managed to depict a complete panoply of personalities, giving depth to the story and enjoyment in the reading. It’s impossible to say anything about the plot without giving it away, but I would just say that reading this is a roller-coaster ride about a woman who often creates her own problems – much as we all do at times – and, as a result, it’s a really great read.